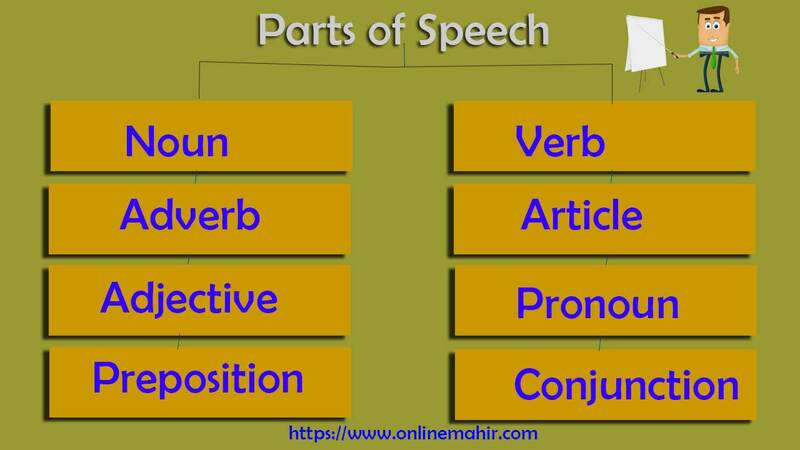 In this lesson, I am going to give you an introduction of parts of speech in Urdu language. We always give our reader multiple options of choices. Either you can read this lesson in this post, can download its PDF file or can watch its video by clicking links below the end of this post. Like verb tense, parts of speech are a very important part of English grammar. It is another step to take you towards the fluency of the English language. let take a brief review of Parts of speech. There are eight 8 parts of speech in English grammar. if you want to improve your fluency, you will have to learn them carefully. Note:- You must be able to recognize them when they come in a sentence. A noun is the name of a person, place, animal or things; as Boy, beach, cow, mango, ice cream etc. The adjective is a word that describes a person, a place or thing; in other words, it tells us about the color, age, merit or demerit of a thing. There are some adjectives; as, red, old, beautiful and ugly are all adjectives. The adverb is used to modify verb, adjective and even an adverb. Very, sometimes, carefully are some adverbs. There are three articles “a”, “an” and "the". “A” come before a word that begins with a consonant letter and “an” is used with word that begins with a vowel letter. Article “the” is used before a specific person, place or thing. A verb is the main part of a sentence. It shows the time of an action or event. These are some verbs; as, go, eat and write etc. A preposition let us know about the position of a thing. It tells us about the specific place where thing exists. On, into, up, down are preposition that shows the specific place of a thing. Conjunction is also called joining word that joins two words or two sentences together. And, or, for are some conjunction words. نیچے کسی ایک button پر کلک کرکے اس lesson کو اپنے دوستوں میں Share کریں۔ شکریہ! You May Like Our Videos Which are Related.